Even before we had Justin, my husband and I have both been mall lovers. When Justin was born, our weekly trips to the mall have become even more fun and exciting. Our family loves eating out, playing games or just strolling around. If you want to join Mommy Moments, visit Chris’ The Mommy Journey. 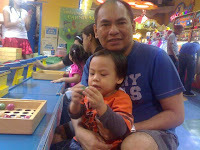 This entry was posted in Bonding Moments, Mommy Moments. Bookmark the permalink. They just made an upgrade on Blogger Following, Google Friends Connect are now being integrated to it. I have been using both features. To prevent any public humiliation on the users, Google set the settings of Blogger following to private. If you have noticed that I am not following you, I already fixed the followers issue. I hope that it will not affect our blogging relationship. we love malling din! nku, sobrang di kumpleto week namin pag di kmi naka-drop by sa mall! It’s the same story with me and my family – mall on weekends, eat out, arcades, etcetera. It’s a good break for all of us. 🙂 Happy weekend! We love going to the mall too. And it certainly becomes more fun when we bring our kid along. I can see Justin has been enjoying his malling time with mommy and daddy. Oh malls! Ika nga ng Ayala, love ’em all! Hehe! Thanks for sharing all these wonderful photos. We love weekends too. It’s a perfect time to bond with the family. We also enjoy spending time at the mall.